FoxPDF Free JPG to PDF Converter, Free JPG to PDF Converter, Free Convert JPG to PDF, JPG to PDF etc. The best Free JPG to PDF Conversion Available. 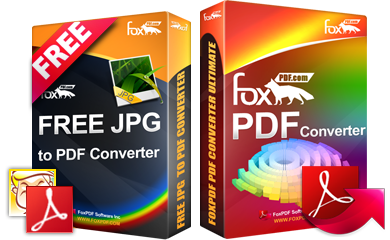 FoxPDF Free JPG to Pdf Converter let you free batch convert JPG into vector PDF files, quick and easily. It is a free windows application for quickly converting jpg file into a single pdf document. Why Choose FoxPDF Free JPG to PDF Converter? Only drag and drop your JPG files and it doesn't require Adobe Acrobat or Adobe Reader while converting JPG to PDF.
. Convert all the pages, or partial pages of JPG documents to PDF file.
. FoxPDF Free JPG to PDF Converter supports a wide variety of versions of JPG files.
. JPG to PDF Converter Support Convert in high speed. Step 2: Run FoxPDF Free JPG to PDF converter, then add JPG files to converting panel. Step 4: After all JPG file you want to convert has been added to the JPG to PDF converter, Click the CONVERT button to start converting. That’s all, it's very easy for you to convert JPG files to PDF with FoxPDF Free JPG to PDF converter. Why you need to convert JPG to PDF? JPG is a file extension for a lossy graphics file. The JPEG file extension is used interchangeably with JPG. JPEG stands for Joint Photographic Experts Group who created the standard. JPG files have 2 sub-formats, JPG/Exif (often used in digital cameras and photographic equipment), and JPG/JFIF. However PDF is de facto the standard for the document interchange over the Internet. If you need to convert your JPG to PDF on the desktop, you can use FoxPDF Free JPG to PDF Converter. JPG is a file extension for a lossy graphics file. The JPEG file extension is used interchangeably with JPG. JPEG stands for Joint Photographic Experts Group who created the standard. JPG files have 2 sub-formats, JPG/Exif (often used in digital cameras and photographic equipment), and JPG/JFIF.